Sean Brock will show you how. When it comes to chicken recipes, there are so many to choose from. We ourselves have found 75 different ways to cook this bird. And most of them are pretty simple and wholly satisfying. It's chicken, after all. The thing is though, a great many of those chicken recipes are forgettable. Made one night and forgotten all about the next. Today, that ends. 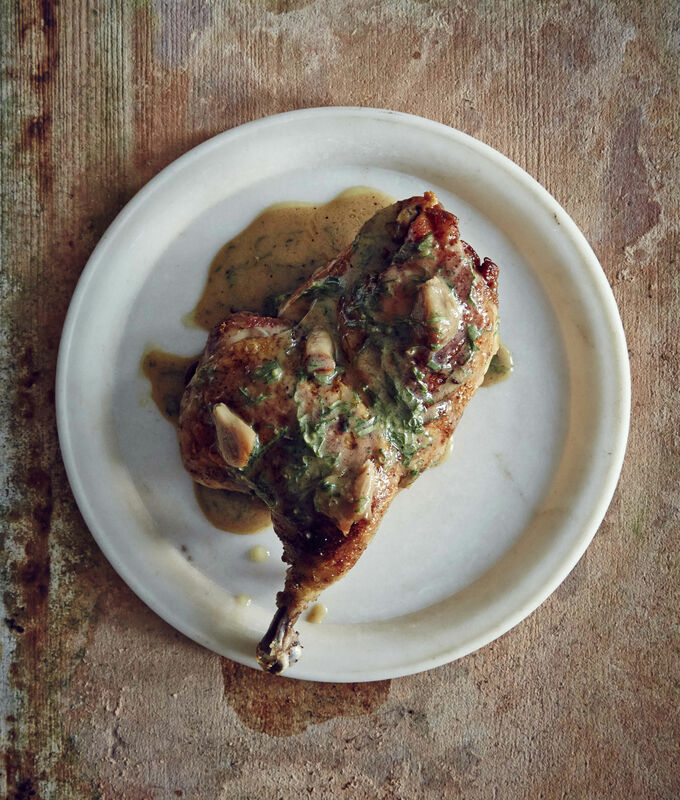 Today, with the help of Sean Brock (award winning James Beard Chef) and his new breathtaking and downright impressive cookbook "Heritage," we have a chicken recipe that you will never forget. One that will make you overlook the fact that there are hundreds of ways to cook chicken. One that you'll happily eat every day until your olden days. This chicken recipe we speak of is a skillet roasted chicken, and not only is it superb, it's easy to make too. There is a catch though, you're going to need a cast iron skillet (which means you'll have to know how to care for one). If you don't own one yet, this is the perfect reason to get one -- I mean, just look at that chicken. Excerpted from Heritage by Sean Brock (Artisan Books). Copyright © 2014. I love cooking chicken like this at home: it fills the house with an amazing aroma. The flavors of garlic, lemon, and parsley are classic and simply delicious. You can throw the dish together at the last minute with minimal shopping and prep. I serve it with a simple salad or a very fresh vegetable quickly cooked on the side. 1. Preheat the oven to 400°F. Cut two 12-inch squares of aluminum foil and lay one piece on top of the other. Place the garlic cloves on the foil. Sprinkle with the sugar, salt, and pepper. Pour the olive oil over the garlic cloves. Shape the foil into a pouch by bringing the edges of the foil together over the garlic and sealing them. Flatten the bottom of the pouch so it will stay upright in the oven and place it on a baking sheet. 2. Roast the garlic for about 30 minutes, until the cloves are very soft but not falling apart. Set the garlic aside in the pouch. Leave the oven on. 1. Using kitchen shears, cut down along both sides of the backbone, then clip it out. Cut the wings off at the first joint. (Freeze the backbone and wing tips to make stock.) Split the chicken in half. Use paper towels to dry the skin. Season both sides of the chicken with salt and pepper. Place the chicken in a baking dish and let it sit at room temperature for 20 minutes. 2. Place two 12-inch cast-iron skillets over high heat. When the skillets smoke, add 1⁄4 cup of the canola oil to each. As soon as the oil smokes, carefully add a half chicken to each skillet, skin side down. Weight each chicken half with another heavy skillet or pan so it stays flat and browns evenly. Cook the chicken, with the weights on it, until the skin is crispy and evenly browned, 5 to 7 minutes. Remove the weights. 3. Flip the chicken over, and place the skillets in the oven. Roast the chicken for about 20 minutes, until an instant-read thermometer inserted into the thickest part of the thigh reads 155°F. Place the chicken on plates to rest while you make the sauce. 1. Combine the roasting juices and fats from both skillets into one; set aside. Place the other skillet on the stove over medium heat until it is hot to the touch, about 1 minute. Pour 1 cup of the chicken stock into the skillet and use a spatula to scrape the browned bits from the bottom of the skillet, then gently boil the stock to reduce it by half, about 5 minutes. Add the remaining cup of stock and set aside. 2. Place the skillet with the roasting juices over medium heat. Sprinkle the flour evenly over the juices and gently whisk it in until there are no lumps. Reduce the heat to low and cook for 2 minutes, stirring constantly with the whisk; do not let the roux get too dark around the edge. Whisk in the chicken stock, making sure to fully emulsify it. Increase the heat to high and bring the sauce to a simmer, then reduce the heat to medium-high and reduce the sauce until it coats the back of a spoon, about 5 minutes. 3. Add the parsley, lemon zest and juice, and 2 tablespoons of the garlic oil from the pouch of garlic and whisk to combine. To complete: Place the garlic and pan sauce over the chicken and enjoy.